For today’s card, I wanted to compare warm and cool greys in my Copic Markers. I picked one of my videos that’s gotten the most views…Coloring White with Copic Markers. Rather than doing just a white object, I did a little mad scientist who’s wearing a white jacket, and as I got started in the planning, it led to a study on all the different greys. If you can’t see the video below, click HERE to watch it directly on YouTube. It really is quite amazing how different the warm and cool greys look when side by side. And how little difference there is between them if you’re NOT looking at them side by side! 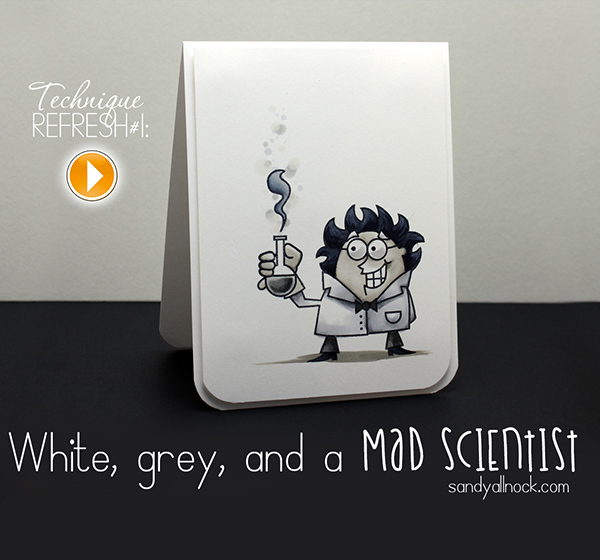 So happy to have finally compared my warm and cool greys – now I have some idea why I want to use one or another! OMG! you are one talented colorer? colorist? whatever, you rock! Sandy! What an awesome card… But I am laughing just as hard at the fact that you call the foam tape “the precious”!!! Lol! I am dying! Sandy, you always rock the coloring! Love your style! Very cool! Thanks so much for showing us how the various greys really are different. This was a madly brilliant tutorial! Love the video and cute card. This is going to be a great feature, and since you asked….can you go back and re-visit coloring a night scene? That’s one of my favorites. Glad to see you getting back into “a groove” and hope each day is getting a little better for you. 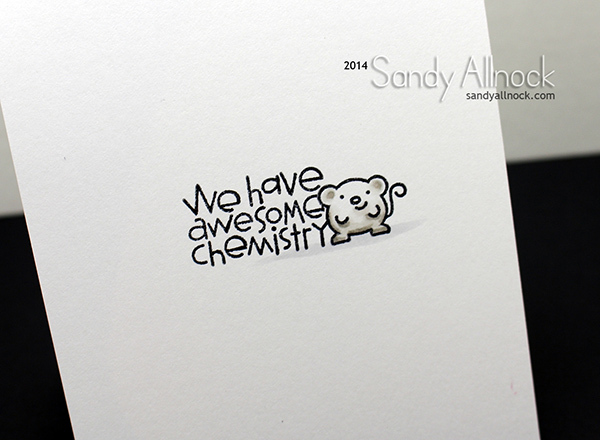 I love this stamp from Paper Smooches, and looks great in grey. I use to colour the hair in green and I love it ’cause he seems more “crazy”. That’s such a fun card and the video is awesome. I think your idea of re-doing certain videos is brilliant. I also appreciate that you add wonderful touches to enhance the images like adding a gel pen or texture. I learn something new every time. Thanks. 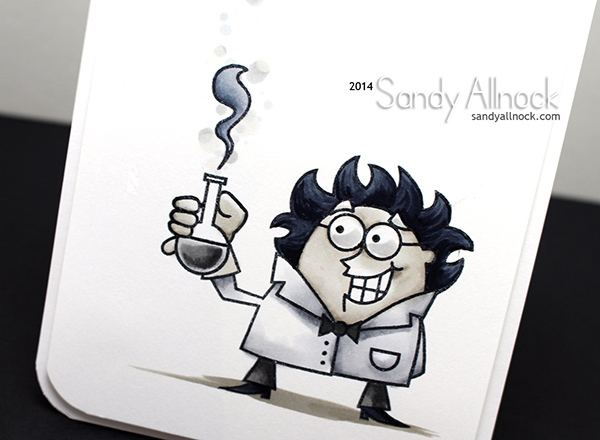 …….Love the card and the idea of showing the most popular techniques again. Thanks for sharing. Is there anything you can’t do. Listen to that mad scientist voice. You made this guy look amazing.